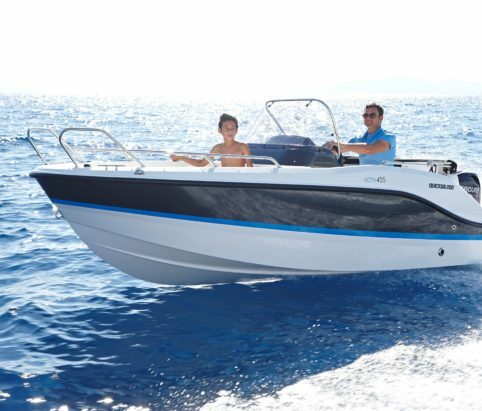 The Quicksilver Activ 455 Open combines all the ingredients for safe cruising in an ultra-modern, versatile and ergonomic package. Step aboard with family and friends and cast off for a smooth and relaxing ride. The Quicksilver Activ 455 Open’s ultra-modern hull, deep cockpit and unsinkable design make coastal cruising a breeze and guarantee safety for both adults and children. The boat is packed with intelligent design features – such as anti-slip flooring and easygrip railing – to ensure the safest possible ride. Easy and secure access to the boat is ensured through the convenient swim platforms that serve as step into the boat. The Activ 455 Open can be motorized with up to 60 horse power. The responsive controls and easy-to-read instrumentation, on the other hand, turn navigation into child’s play. And with an extra-large windscreen, you and your passengers can enjoy the best weather protection. There are dozens of ways to enjoy the water – from cruising and bathing to fishing, recreation and transportation – and the Quicksilver Activ 455 Open is equipped for each and every one of them. Its versatile interior, easy access, large bathing platforms and comfortable seating for up to 5 people make it the ideal companion to delight your passengers, whatever their fancy.